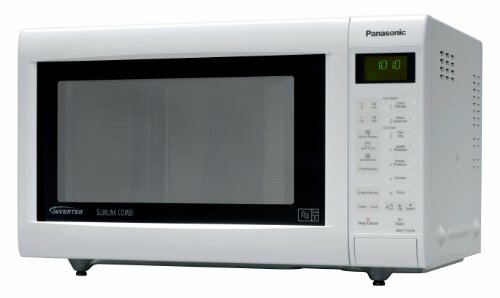 In our latest in depth review, we consider the Panasonic NN-CT552WBPQ combination microwave. On paper it offers 27 litres worth of capacity, complete with 1000w of power, a 1300w grill and a regular 100-220C convection oven, but how does it stack up against the competition? The Panasonic NN-CT552WBPQ is very functional, works well and will be a handy addition to most kitchens. Fairly plain looking. Depending on your tastes, this could be seen as a plus point. The Panasonic NN-CT552WBPQ is a slim line combi microwave oven, offering a plethora of features for a pretty reasonable price tag of around £150 if you're prepared to spend time shopping around. It's slim line body means it takes up a lot less worktop space, yet despite this it still packs in a solid 27 litre capacity, backed up by 1000W of power. Finished in a neutral white colour scheme, it should blend in to the majority of kitchen colour schemes, matching most modern fridges and dishwashers. The Panasonic NN-CT552WBPQ's controls are easy to use, and it both cooked and heated food evenly, with no issues during our test period. Our testers were pleasantly surprised - often high end microwave's can have overly complicated control systems that take a while to get used to - not so with the Panasonic NN-CT552WBPQ, with the simple controls being easy to operate and intuitive when in use. The digital display is easy to read, even in brightly lit environments, and overall build quality is pretty solid, which you'd expect from a manufacturer such as Panasonic, especially at this price range. The exterior of this Panasonic microwave measures 52cm by 31cm by 39.5cm and the NN-CT552WBPQ's interior is approximately 35.9cm by 21.7cm by 35.2cm, complete with a substantial 340mm diameter turntable. Overall it weighs 13.5kg, which is fairly light, especially considering the dimensions and specification of the NN-CT552WBPQ. So who would we recommend the Panasonic NN-CT552WBPQ for? Granted, it's not the cheapest combination microwave out there, but considering the features included and the overall build quality it provides excellent value. In addition Panasonic's construction of the NN-CT552WBPQ means it should provide years of uninterrupted service. The overall 27 litre capacity means it will be suited for both medium and large households alike, and the built in grill and convection oven lend a degree of versatility, and the slimline nature results in a combi microwave that takes up 20% less space than a similar capacity rival model. Overall the NN-CT552WBPQ is a well built and functional microwave - it might not be the most stylish or innovative microwave in terms of design, but it certainly works well and will last the test of time. Essentially it's a combi microwave which places function over form, and is one we would be happy to recommend to our readers.